Trail volunteers gather around to learn more about erosion control techniques to help minimize winter storm damage on Tunnel Trail. 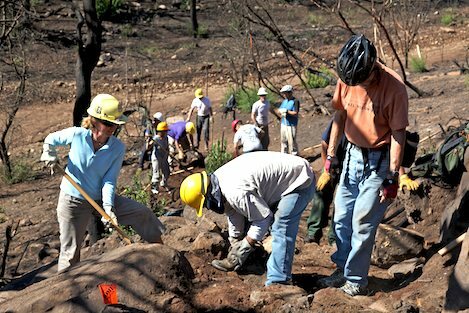 On Saturday, a small cadre of trail volunteers were provided detailed training in advanced erosion control techniques, using rock armoring of the trail, rolling grade dips and a type of “mini-dip” known as a nick. 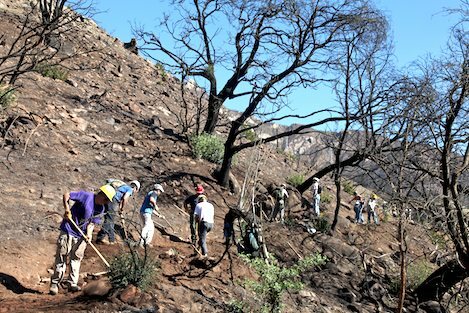 The project was part of the Forest Service burned area recovery program (BAER), which provided funds to help deal with the impacts of the recent Jesusita Fire on Tunnel, Jeusita, Rattlesnake and West Fork of Cold Spring trails. Villanueva goes over the basics of getting water off the trail. 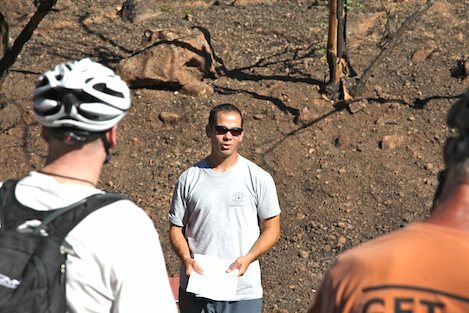 To train the CC crews in the more advanced techniques and to identify problem areas, Kellogg was also able to hire a trails engineer from the Lake Tahoe Basin Management Unit, Garrett Villanueva. 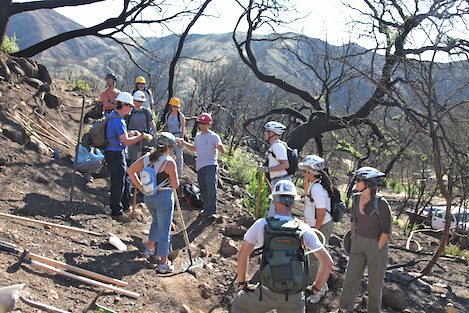 Villanueva has hundreds of hours of experience in dealing with similar trails in the Lake Tahoe area as well as working with volunteer groups and he offered to spend a Saturday with our local Santa Barbara trail volunteers to help train them as well. After a safety talk Villanueva provided a brief introduction to dealing with getting water off the trail. “What we are talking about is hydrologic connectivity,” he said. “That’s the ability of water to flow along a path for long periods of time. We need to be able to break up that flow – specifically on trails – so that the water is never allowed to continue down them for more than 20-30 yards at a time. 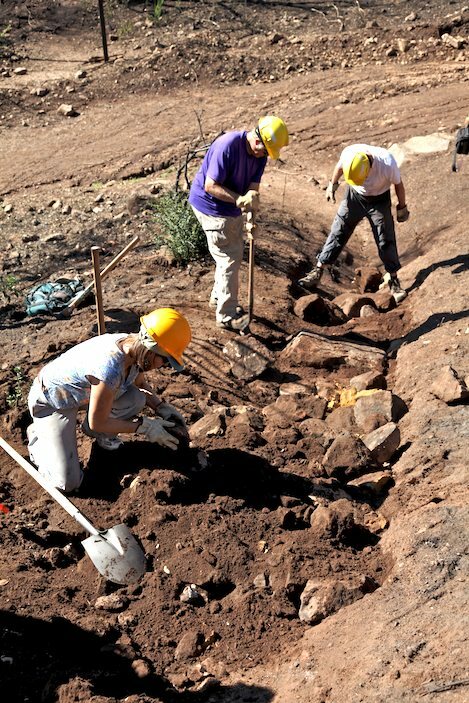 During first part of creating a dip, workers fill in the gully with rock to armor it. As the group assembled at the bottom of Tunnel Trail Villanueva explained what’s involved in building such a dip. With tape measure in hand he marked out a 24-foot-long distance, marking the beginning, middle and ending points. “Here are the basics,” Villanueva said. “A true rolling grade dip needs to drop gently and then rise back up gently, with a drop that’s enough so the water can’t continue down the trail but with a length that is long enough the trail user hardly feels that it’s there. Thus the 24-foot length: that’s 12 feet in and 12 feet out. Lower part of the dip begins to take shape. After being armored with rock, workers begin to pull soil down over the rocks to a height water cannot go over it. Below, other workers fill in gully with more rock. “The trail is fairly steep here,” Villanueva also noted, “and it’s gullied too, which makes it seem like it’s almost impossible to get the water out of the gully and down the hillside but it’s not. “To create the dip, the trail needs to drop gradually to the low point of the dip before it rises again. If the gully is deep like it is here, we can fill part of the gully with a layer of rock and then move the soil from the outside berm into the gully to fill it in and cover the rocks. That accomplishes three things: it helps reinforce the trail by armoring it with rock, the dip is created without having to move as much soil and less material is available to erode down hill next time it rains. Dip is starting to take shape as soil is moved uphill to cover the rock and pulled downhill to build up the berm. Spitting into three groups, over the next few hours the volunteers slowly began to work out the process of designing and building their dips. With plenty of rock nearby and easy-to-work soil thanks to the recent rain, the work went quickly. Lower part of another dip from above, well armored with rock. First, rock was collected for use in armoring the trail. Then trenches were cut at a 90 degree angle to the trail at the lower end of each of the dips, far enough into the hillside and outside berms to create solid anchor points. Then large rocks (the 200 pound type) were gently lowered into the trenches and set side by side, with their edges lined up to help lock them in place. Finally then, smaller rocks were placed into the cracks to lock them together even more with a final “keystone” rock set as the final piece of the puzzle. Once the lower part of the dip was armored, other volunteers then began to cut into the middle part of the dip, moving dirt from the outer berm to fill in the gullies. “Don’t knock that dirt down the hill,” Villanueva reminded the group. “We can use that to cover the parts of the dip that we just armored. Further up trail, other volunteers finish another type of water control feature known as a nick. Slowly each of the dips began to take shape. In places where the gully cutting down the trail was really deep, small rocks were added to provide additional armor to the tread. Then the higher parts of the outside edge were knocked off and moved uphill to cover the rocks. In an hour the dips had begun to take shape as the volunteers began to understand the concepts. In another half hour they were ready for inspection. Hopefully the CC crews will be as willing and able as were these fifteen dedicated workers. 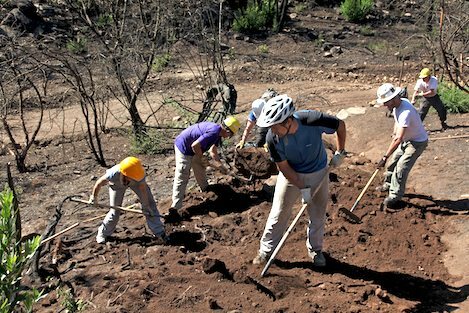 But then, if the CC’s don’t finish the work we now have a solid corps of local hard-core trail volunteers who can. 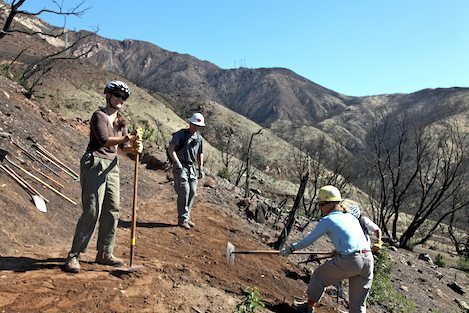 Volunteers support Forest Service crews in adding erosion control features to trails burned during the Jesusita Fire. 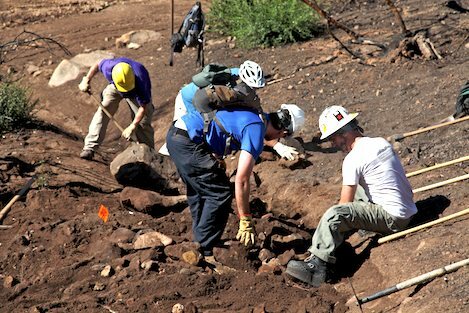 Additional volunteers will be needed this winter to help maintain the recent work.